I visited the family at their shack outside of Phnom PEnh. They now fear that the hospital staff will come after them because their story has been in the paper. I will write to the health minister for his explanation in parliament. 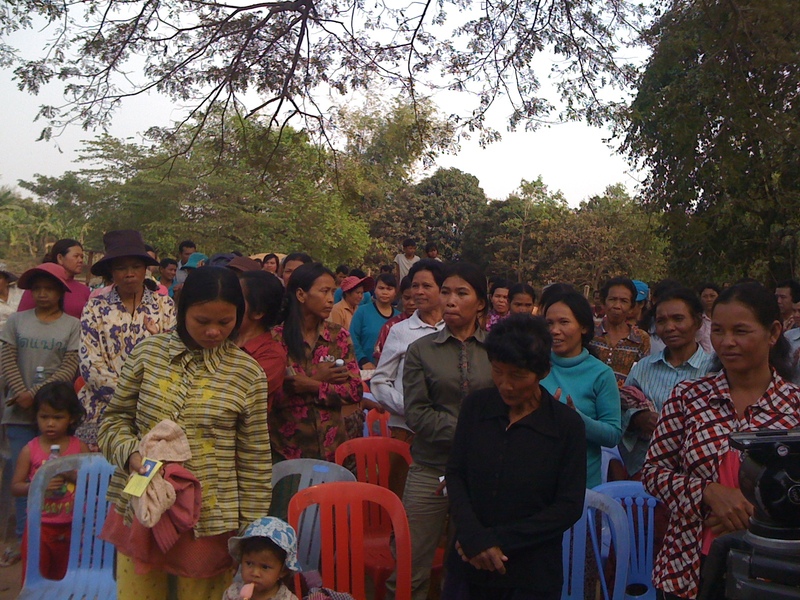 The same day, a woman in Kompong Thom died in delivery after a second surgery. Besides moving hospital staff involved in malpractice, the ministry of health has taken very soft measures to address misconduct and malpractices. We are at 5 months before next parliamentary elections and already the ruling party CPP is working hard, even with vehicles from German Cooperation . My colleagues and I immediately noticed that the 3 men were wearing T-shirts with the CPP logo in front and the party name written on the back. The 2nd man moved fast to the other side of the car to open the door, reached for a plain shirt and put it over party T-shirt. Too late! 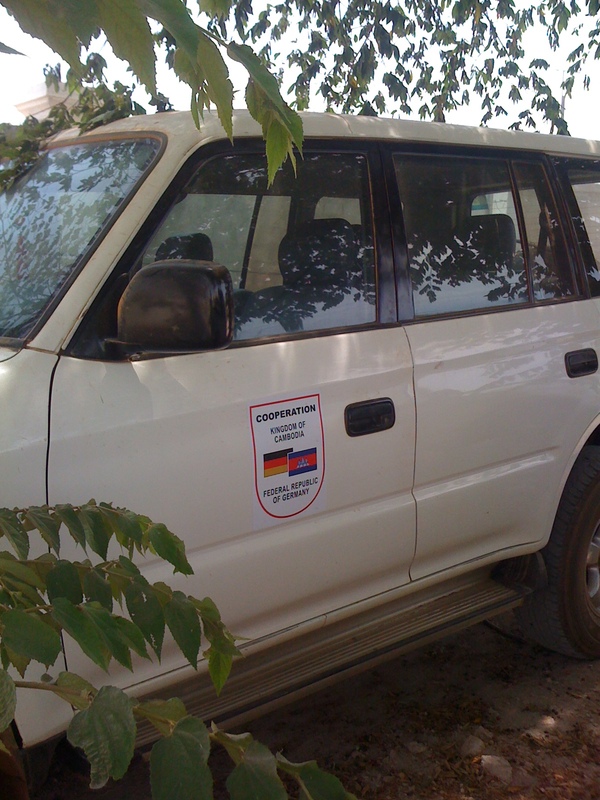 what will the German Cooperation have to say about free and fair election and their monitoring system of vehicles in the hands of the Cambodian government. The 2nd man trying to cover his party logo. 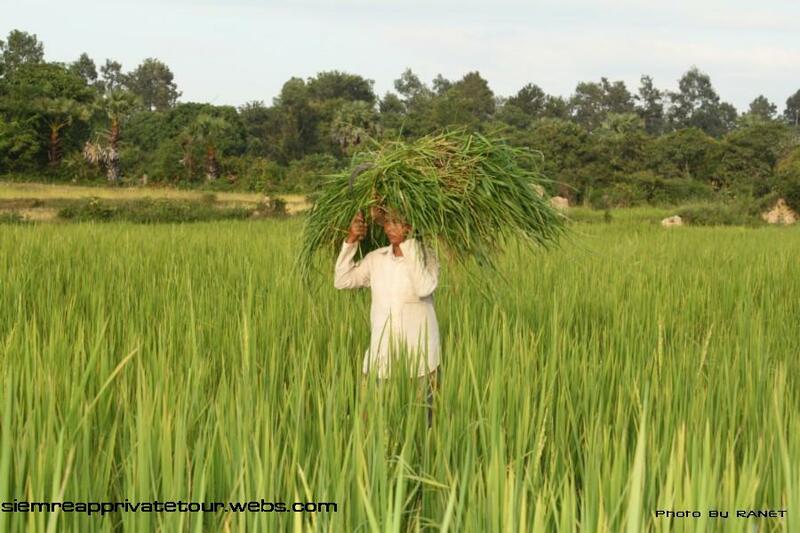 Legislative elections in Cambodia are scheduled for July 28, 2013. Their organization by the National Election Committee (NEC), controlled by the authoritarian Cambodian People’s Party (CPP), which has been in power for 34 years, runs fundamentally counter to international standards. Methods used by the NEC/CPP include the manipulation of electoral lists, which allows the CPP to give itself a 27% start over the opposition before polling day. This 27% lead is made up of fictional voters, an automatic reservoir of support for the ruling party (10%) (1), and of real voters who are known to be favorable to the opposition and whose names are surreptitiously removed or deemed invalid by the NEC (17%) (2). At the same time, the human rights situation continues to deteriorate with political opponents, critics and protesters being arrested, convicted and sent to prison on trumped-up charges. As leader of the opposition I have found myself the victim of the CPP judicial machine. I have been sentenced to a heavy prison sentence, forced into exile and deprived of my civic and political rights. I am therefore excluded from the electoral contest, which will allow the outgoing CPP prime minister to retain his post without being challenged. Faced with this totalitarian drift toward a one-party system, it is essential to support the United Nations, which has recommended a series of reforms to make the coming elections acceptable by international standards. Two key ideas are included in the recommendations: a reform of the composition and operations of the NEC to make it more impartial and credible, and the safe return of the leader of the opposition who must be able to stand as a candidate for prime minister and to take part fully in the electoral campaign as in any parliamentary democracy. 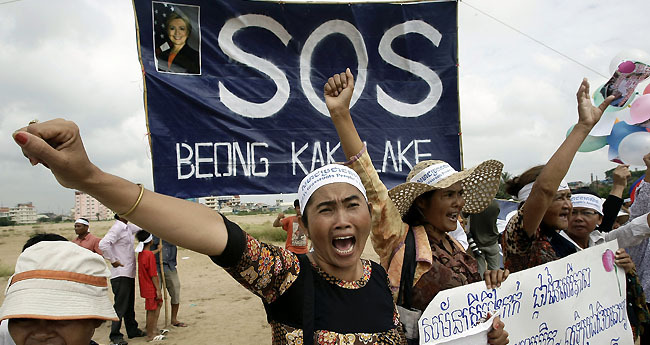 But as long as the Cambodian government continues to reject the UN recommendations, other international organizations, friendly countries and non-complacent non-government organizations are asked not to send electoral observers. In fact, based on the above figures, the result of the July 28 election has already been decided: another landslide victory for the CPP, which will defeat the opposition by at least 27%. There is no point going to watch a game that has been fixed in advance. Some ill-informed observers just risk validating the charade, which represents an injustice to the Cambodian people, whose will is being distorted. 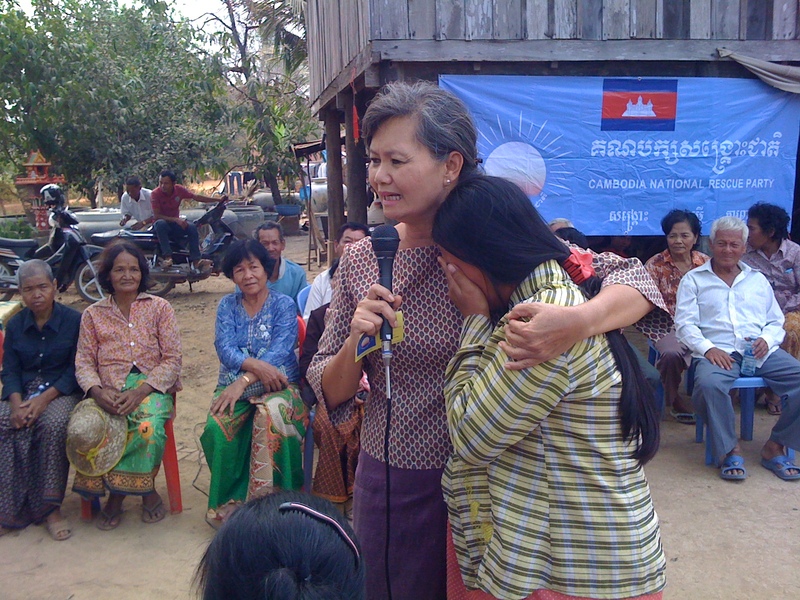 In the communal elections of June 2012, the CPP won a Soviet-style victory, while the two components of the parliamentary opposition – now merged into the Cambodia National Rescue Party – still won 31% of the vote, despite the famous 27% handicap and other unfair practices by the CPP. International organizations and friendly countries are also asked to make known to the current government of Cambodia that, after July 28, any government arising from fraudulent and illegitimate elections will, given the scale of the fraud, be likewise considered as illegitimate. President of the Cambodia National Rescue Party and leader of the opposition. (1) Fictional, or phantom, voters significantly inflate the electoral register, which has 9.7 million names while the population of voting age is only 8.9 million. See “Sam Rainsy Calls Foul on National Voter Register” in The Cambodia Daily, January 23, 2013. There is clear evidence of impersonation. (2) On the eve of communal elections on June 1, 2012, about 1.5 million legitimate voters, or 17% of the electorate, were likely disenfranchised. 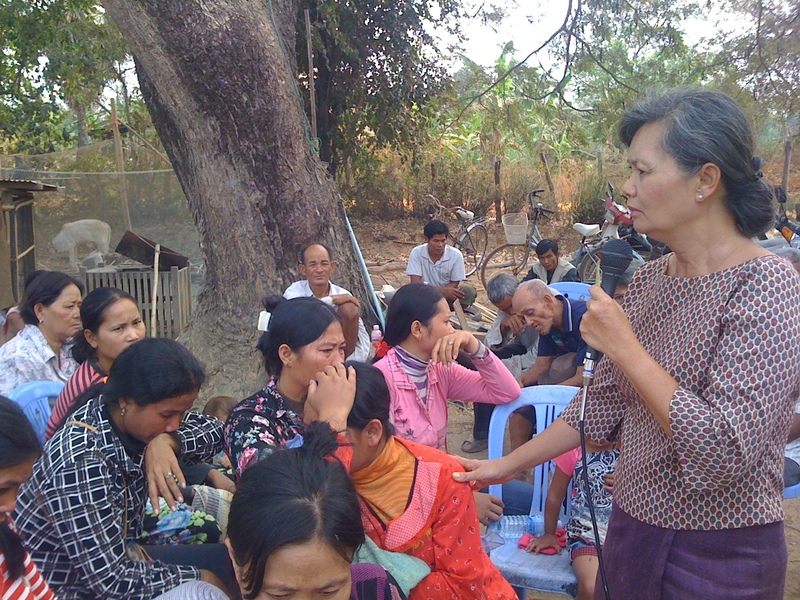 See “Ahead of Elections, Right to Vote in Doubt for 1.5 Million” in The Cambodia Daily, February 29, 2012, and “Names Missing from Voter Rolls,” Radio Free Asia, May 10, 2012. “What is the cost of delivery?”, I asked a 9-month pregnant young mother. A cry from the more than 100 people, 90% women who came to listen to my speech: “$25 and that does not include transportation and medicine and the bed”. It is the same answer I hear everywhere. I told the stories of women who died because their families could not pay the hospital fees and just two weeks ago of a very poor woman who was denied medical care and delivered her baby on the railroad track. The women started crying and putting their heads down of anger and despair. It takes more than firing the medical staff and more than appealing for medical staff to have ethics. It takes women in the entire village to demand accountability from politicians, from political parties. “Vote for free health care. It is your vote. it is your life and not just destiny if you are poor”. A film that tells the real lives of people down the development line A River Changes Course. Proud of you Kalyanee Mam. 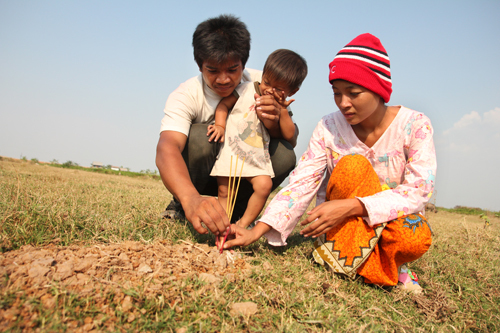 Where Will Cambodia Find Enough Land for the Next Generation? The women in these photos returned from the Cambodia/Thai refugee camps in 1991 during the repatriation organized by UNTAC. 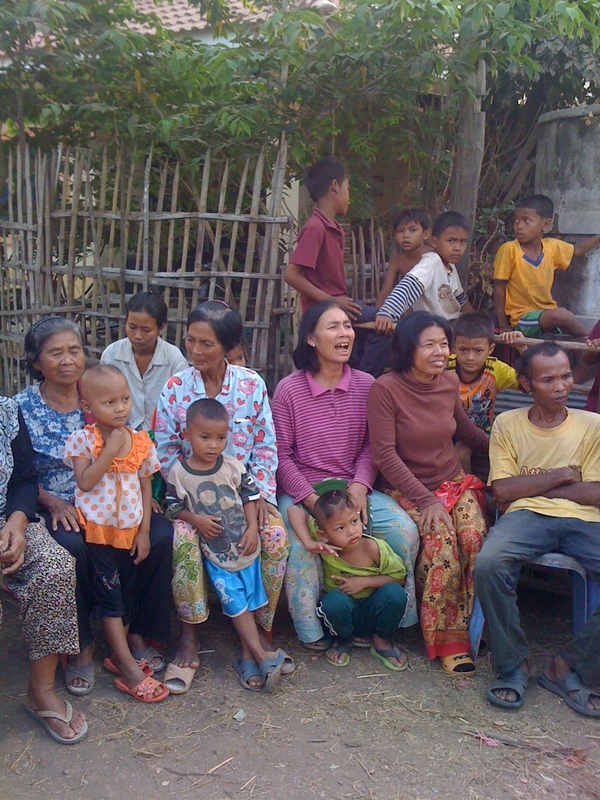 More than 2 decades later they are stuck in this village in Battambang and some are landless as they sold their land to pay off debts. 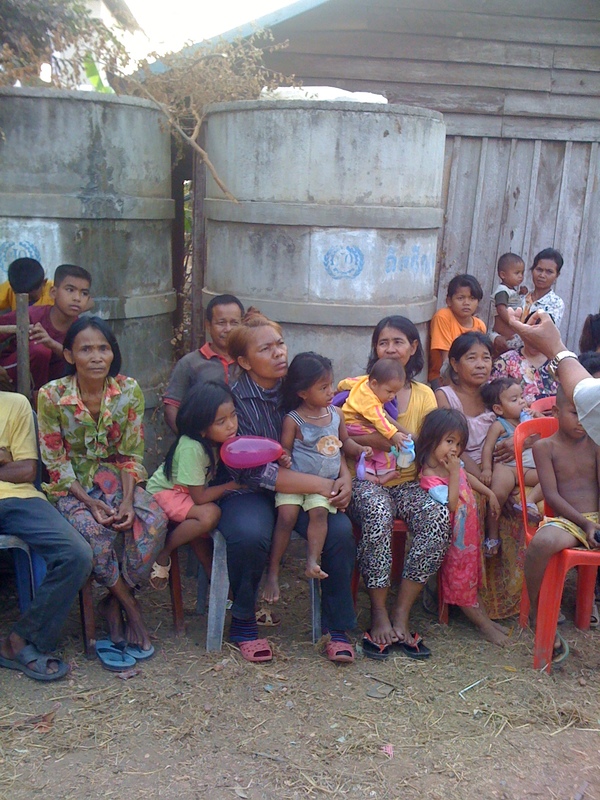 They now are caring for their own grand-children because the parents have left the village to look for work in Thailand. Tat Marina is the only one who continues to pay a very high price for a crime she never committed. She continues to fight for justice because the high ranking official and his former wife never spent one day in court. Over a decade has gone by but let us not forget. As we are approaching International Women’s Day, we must recollect all the names of the women who have been paralyzed, disfigured and lost their lives but justice has never been served as justice in Cambodia is for sale and women have neither money nor power to purchase justice.